A significant number of Malayali LGBTIQ people opt to work outside Kerala, for hardly any firm in the state has LGBTIQ inclusive HR policies. Those who survive, in Kerala, opt to not disclose their sexual orientation at workplaces as they fear extreme responses of homophobia. 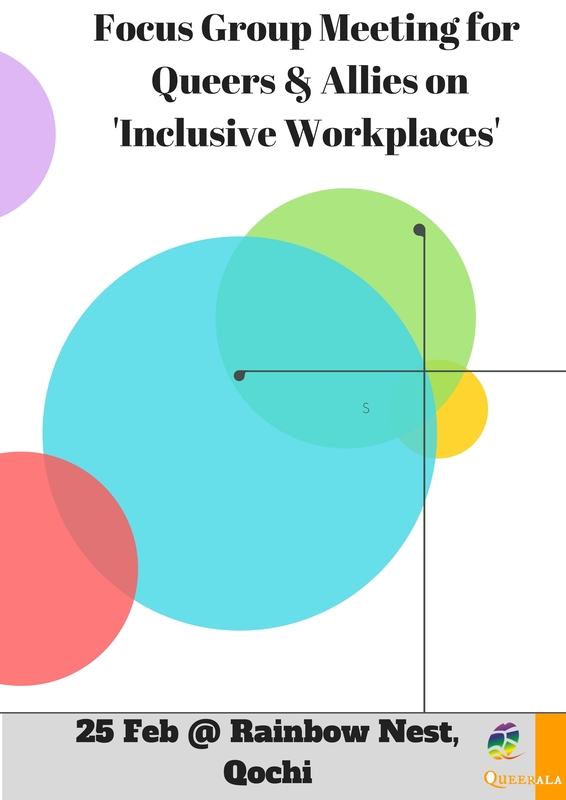 In parallel to this, visibility of LGBTIQ individuals at Workplace can affect their human resource, unless the employer has Inclusive HR policy that doesn’t discriminate employees on grounds of Sexual Orientation and Gender Identity. Sustained interactions with Malayali queer individuals, who work across conglomerates, IT spaces etc. have helped us identify hundreds of people who hide themselves while facing subtle and extreme levels of homophobia. To bring signs of comfort for them or anyone, to be oneself, a dialogue on Inclusive Workplaces, is found vital. Queerala invites LGBTIQ people, who work across various streams of jobs, and allies for our monthly Focus Group Meeting(FGM) on ‘Inclusive Workplaces’. The FGM shall address keys of expanding ally network across workspaces like the Infopark-Cochin, Govt Departments, Non Govt Organizations etc. This gathering shall be a preface to identifying options for inclusive work environments and familiarizing businesses which support LGBT workforce, in terms of diversity. The meeting is scheduled for 25 Feb, 11am-4pm at Rainbow Nest, Qochi. Those who wish to participate kindly email us at queerala2014@gmail.com or contact- 8075645060. The venue details shall be shared upon confirmation of participation. focus group, inclusive workplace, Kerala, meeting.